SuperSearch is the PUP that uses misleading techniques to prevent removal. Use Reimage to locate malicious components and get rid of them faster than with uninstall instructions. A full system scan blocks virus reappearance and prevents traffic to malicious domains. SuperSearch is an adware which redirects to suspicious websites. 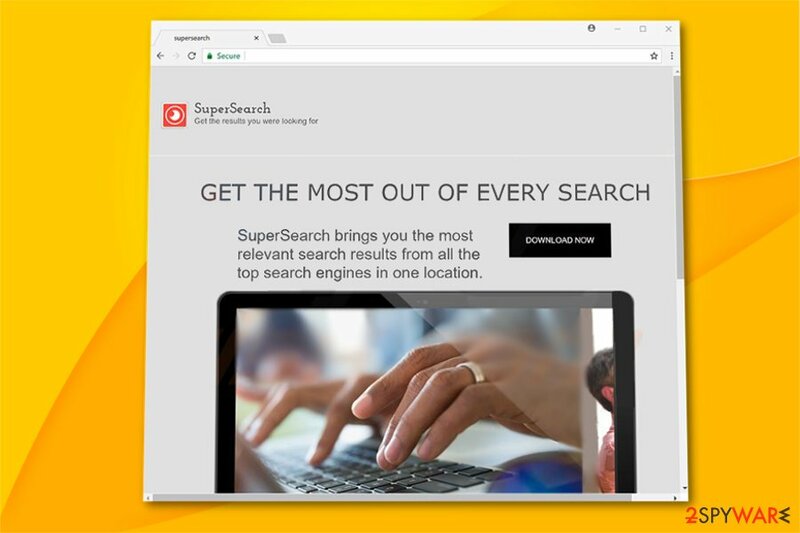 SuperSearch adware is a highly questionable app presented as a tool for browsing and receiving the most relevant search results. However, once installed, the program modifies different web browsers at once and then starts filling them with misleading content. You may mix it with an infamous browser hijacker called super-search.org but these two apps are coming from different developers. This PUP is designed to fill your web browser with pop-up ads, in-text links, banner ads and similar content to gan income via the “pay-per-click” scheme. Yet another worrying fact related to this adware is that SuperSearch virus has mostly been spreading around with the help of the bundling technique, so don't surprise after discovering it on your system out of nowhere. Besides the risk of getting tricked by installing software that you don't need, you can also notice continuous slowdowns or even crashes while surfing the web. Additionally, you can find yourself on a malware-filled domain because your security is not the main aim of such apps' developers. Because of that, we recommend you to remove SuperSearch adware from the system. You can do that by using an anti-malware tool (our suggestion is Reimage) or using the guide provided at the end of this post. SuperSearch ads, redirects, and slowdowns are not the only problem this PUP might cause. According to IT professionals, this adware can also start gathering various details about its victim. Typically, they are related to people's browsing activity and include search queries, pages viewed, various bookmarks, computer's IP address, etc. However, we cannot assure you that this data won't be transferred to cybercriminals' databases and used to gain revenue. To su up, you shouldn't get tricked by adware's appearance and promises to help you improve your searches online. It still is considered as a harmful program and requires to be eliminated from your PC and web browser. Perform SuperSearch removal straight away in order to avoid more harmful consequences of this PUP. Notice, that these changes are irreversible and can be undone only if you get rid of the adware itself. If you are wondering how to prevent SuperSearch hijack, continue reading to get more information about bundling and similar techniques used by virus developers to spreads their PUPs around. If you have already become a victim, uninstall SuperSearch adware immediately. You can find manual elimination instructions provided at the end of this article. Although, automatic removal is not only a faster but also safer option to clean your system from various cyber threats and potentially unwanted programs (PUPs). SuperSearch is a potentially unwanted program which is distributed via software-bundles. We all know, how important it is to surf the Internet carefully, but not every one of us does that with proper cautiousness. However, this is usually the main reason why people get their browsers infected by browser hijackers in this way making surfing harder for them to maintain. You have to know that such PUP can hide in various dubious-looking pages. Do not enter any site that is unrecognizable to you as it might contain links which can redirect you to harmful content. If you have already entered such suspicious page – close it immediately and do an antivirus scan to check if any harmful components managed to get in. Furthermore, better use original downloaders, not third-party ones. Download only trustworthy programs, as freeware provided by secondary sources can contain improper content and not fit in the security requirements. All in all, highly increase your computer safety by always keeping your anti-malware program up-to-date. If looked after neatly, it will help you in a very difficult situation and display instructions, how to solve various infections' problems. To remove SuperSearch virus manually, you have to eliminate all harmful components which might be inserted by the cyber threat. This kind of content might contain various browser extensions, apps, and dubious browser plug-ins. Read the following instructions step by step in order to succeed in the elimination. If you want to opt for a quick SuperSearch adware removal and perform it within a couple of minutes, chose one of an anti-malware programs given below. This will help you to get rid of the threat from each of web browsers, Google Chrome, Mozilla Firefox, Microsoft Edge, Internet Explorer. We advise refreshing all browsers that were infected by this adware after you finish with the cleaning. Here, look for SuperSearch or any other recently installed suspicious programs. Wait until you see Applications folder and look for SuperSearch or any other suspicious programs on it. Now right click on every of such entries and select Move to Trash. When in the new window, check Delete personal settings and select Reset again to complete SuperSearch removal. Once these steps are finished, SuperSearch should be removed from your Microsoft Edge browser. Here, select SuperSearch and other questionable plugins. Click Remove to delete these entries. Now you will see Reset Firefox to its default state message with Reset Firefox button. Click this button for several times and complete SuperSearch removal. To remove Super Search from Chrome, you need to get rid of questionable extensions. Here, select SuperSearch and other malicious plugins and select trash icon to delete these entries. Click Reset to confirm this action and complete SuperSearch removal. Here, select Extensions and look for SuperSearch or other suspicious entries. Click on the Uninstall button to get rid each of them. Now you will see a detailed dialog window filled with reset options. All of those options are usually checked, but you can specify which of them you want to reset. Click the Reset button to complete SuperSearch removal process. ^ Margaret Rouse. PUP (potentially unwanted program). Tech Target. Search Security. ^ Larry Kim . What Is PPC? Learn the Basics of Pay-Per-Click (PPC) Marketing. Word Stream. All about advertising. ^ Utanvirus SE. Latest technology security new. This entry was posted on 2018-07-17 at 08:35 and is filed under Adware, Viruses. You can quickly scan the QR code with your mobile device and have SuperSearch manual removal instructions right in your pocket. How did you remove SuperSearch?